With so many available style, feature, quality and technology options, selecting the best appliances for your new or remodeled kitchen can be overwhelming, even if you're working with a design or building professional. Creating a design plan and conducting informed appliance research before you start shopping can ensure that you create a stylish, functional kitchen for your family and lifestyle while remaining on budget. Whether you’re working with an existing kitchen layout or creating your new dream kitchen, the layout of your kitchen dictates a lot about the appliances you’ll need to purchase. Be sure to consider how you use your kitchen and the flow and traffic patterns it creates. Take a look at Modular Kitchen Layouts for tips and insights on space planning — the layout you choose can either enhance or limit the types and sizes of appliances that can be accommodated. The budget you establish for your new kitchen will greatly influence the appliances you select, so it needs to be realistic for the size and scope of your project. And, as you choose appliances, be sure you or your trade professional prioritizes this established budget and function over aesthetics. When planning for your new kitchen, you’ll also want to take into consideration your family’s lifestyle and design it around the way you live. 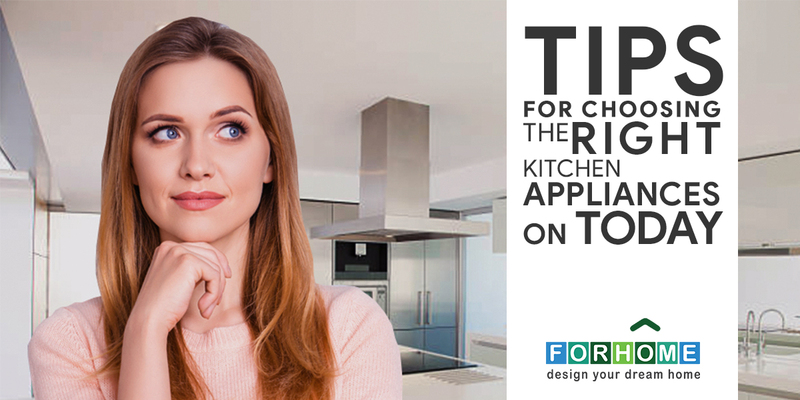 Be sure to make notes on not only how you currently use your kitchen but also how you might like to use it in the future. Drafting a wish list will make it easier to match your needs and wants with appliance features once you start shopping. Whether on your own or with a design professional, try to visit retailers or showrooms for product demonstrations — there’s no substitute for actually using the appliances to determine if they will be a good fit for you ergonomically or for the layout of your kitchen. Once you’ve established your appliance budget and functional requirements, you can further narrow your choices by selecting the style and finishes that complement your kitchen design. In today’s luxury kitchens,stainless steel is the most popular finish option — in addition to being long-lasting and durable, stainless steel’s sleek surface is also easy to clean. Another luxury trend is integrating appliances with cabinetry using custom panels. This involves having panels custom made by a cabinet maker according to the manufacturer’s specifications. When you buy appliances, choose your retailer wisely. The sales representative you work with should be familiar with all the unique product features across multiple brands to aid you in your selection. Plus, retailers can often help with any complicated installation requirements unique to your kitchen design. Also, knowing when and where to buy can benefit your budget — in the Indian retail market, for example, deep discounts can often be had as part of seasonal sales and promotions oriented around major holidays. Also be sure to consider Energy Star-rated appliances to increase home energy efficiency and savings while reducing the impact on the environment. Investing some time before you shop to determine your needs, create a design plan and research appliance features can ensure that your new construction or remodeling project ends up as the kitchen of your dreams.